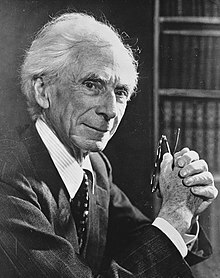 Bertrand Arthur William Russell, 3rd Earl Russell, OM FRS (/ˈrʌsəl/; 18 May 1872 – 2 February 1970) was a British philosopher, logician, mathematician, historian, writer, essayist, social critic, political activist, and Nobel laureate. At various points in his life, Russell considered himself a liberal, a socialist and a pacifist, although he also confessed that his sceptical nature had led him to feel that he had "never been any of these things, in any profound sense." Russell was born in Monmouthshire into one of the most prominent aristocratic families in the United Kingdom. In the early 20th century, Russell led the British "revolt against idealism". He is considered one of the founders of analytic philosophy along with his predecessor Gottlob Frege, colleague G. E. Moore and protégé Ludwig Wittgenstein. He is widely held to be one of the 20th century's premier logicians. With A. N. Whitehead he wrote Principia Mathematica, an attempt to create a logical basis for mathematics, the quintessential work of classical logic. His philosophical essay "On Denoting" has been considered a "paradigm of philosophy". His work has had a considerable influence on mathematics, logic, set theory, linguistics, artificial intelligence, cognitive science, computer science (see type theory and type system) and philosophy, especially the philosophy of language, epistemology and metaphysics. Russell was a prominent anti-war activist and he championed anti-imperialism. Occasionally, he advocated preventive nuclear war, before the opportunity provided by the atomic monopoly had passed and "welcomed with enthusiasm" world government. He went to prison for his pacifism during World War I. Later, Russell concluded that war against Adolf Hitler's Nazi Germany was a necessary "lesser of two evils" and criticised Stalinist totalitarianism, attacked the involvement of the United States in the Vietnam War and was an outspoken proponent of nuclear disarmament. 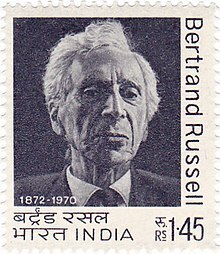 In 1950, Russell was awarded the Nobel Prize in Literature "in recognition of his varied and significant writings in which he champions humanitarian ideals and freedom of thought". His paternal grandfather, the Earl Russell, had been asked twice by Queen Victoria to form a government, serving her as Prime Minister in the 1840s and 1860s. The Russells had been prominent in England for several centuries before this, coming to power and the peerage with the rise of the Tudor dynasty (see: Duke of Bedford). They established themselves as one of the leading British Whig families, and participated in every great political event from the Dissolution of the Monasteries in 1536–1540 to the Glorious Revolution in 1688–1689 and the Great Reform Act in 1832. The countess was from a Scottish Presbyterian family, and successfully petitioned the Court of Chancery to set aside a provision in Amberley's will requiring the children to be raised as agnostics. Despite her religious conservatism, she held progressive views in other areas (accepting Darwinism and supporting Irish Home Rule), and her influence on Bertrand Russell's outlook on social justice and standing up for principle remained with him throughout his life. (One could challenge the view that Bertrand stood up for his principles, based on his own well-known quotation: "I would never die for my beliefs because I might be wrong".) Her favourite Bible verse, "Thou shalt not follow a multitude to do evil" (Exodus 23:2), became his motto. The atmosphere at Pembroke Lodge was one of frequent prayer, emotional repression, and formality; Frank reacted to this with open rebellion, but the young Bertrand learned to hide his feelings. Russell's adolescence was very lonely, and he often contemplated suicide. He remarked in his autobiography that his keenest interests were in religion and mathematics, and that only his wish to know more mathematics kept him from suicide. He was educated at home by a series of tutors. When Russell was eleven years old, his brother Frank introduced him to the work of Euclid, which he described in his autobiography as "one of the great events of my life, as dazzling as first love." During these formative years he also discovered the works of Percy Bysshe Shelley. Russell wrote: "I spent all my spare time reading him, and learning him by heart, knowing no one to whom I could speak of what I thought or felt, I used to reflect how wonderful it would have been to know Shelley, and to wonder whether I should meet any live human being with whom I should feel so much sympathy". Russell claimed that beginning at age 15, he spent considerable time thinking about the validity of Christian religious dogma, which he found very unconvincing. At this age, he came to the conclusion that there is no free will and, two years later, that there is no life after death. Finally, at the age of 18, after reading Mill's Autobiography, he abandoned the "First Cause" argument and became an atheist. He traveled to the continent in 1890 with an American friend, Edward FitzGerald, and with FitzGerald's family he visited the Paris Exhibition of 1889 and was able to climb the Eiffel Tower soon after it was completed. Russell was 17 years old in the summer of 1889 when he met the family of Alys Pearsall Smith, an American Quaker five years older, who was a graduate of Bryn Mawr College near Philadelphia. He became a friend of the Pearsall Smith family – they knew him primarily as "Lord John's grandson" and enjoyed showing him off. He soon fell in love with the puritanical, high-minded Alys, and, contrary to his grandmother's wishes, married her on 13 December 1894. Their marriage began to fall apart in 1901 when it occurred to Russell, while he was cycling, that he no longer loved her. She asked him if he loved her and he replied that he did not. Russell also disliked Alys's mother, finding her controlling and cruel. It was to be a hollow shell of a marriage. A lengthy period of separation began in 1911 with Russell's affair with Lady Ottoline Morrell, and he and Alys finally divorced in 1921 to enable Russell to remarry. During his years of separation from Alys, Russell had passionate (and often simultaneous) affairs with a number of women, including Morrell and the actress Lady Constance Malleson. Some have suggested that at this point he had an affair with Vivienne Haigh-Wood, the English governess and writer, and first wife of T. S. Eliot. From 1922 to 1927 the Russells divided their time between London and Cornwall, spending summers in Porthcurno. In the 1922 and 1923 general elections Russell stood as a Labour Party candidate in the Chelsea constituency, but only on the basis that he knew he was extremely unlikely to be elected in such a safe Conservative seat, and he was unsuccessful on both occasions. Before World War II, Russell taught at the University of Chicago, later moving on to Los Angeles to lecture at the UCLA Department of Philosophy. He was appointed professor at the City College of New York (CCNY) in 1940, but after a public outcry the appointment was annulled by a court judgment that pronounced him "morally unfit" to teach at the college due to his opinions, especially those relating to sexual morality, detailed in Marriage and Morals (1929). The matter was however taken to the New York Supreme Court by Jean Kay who was afraid that her daughter would be harmed by the appointment, though her daughter was not a student at CCNY. Many intellectuals, led by John Dewey, protested at his treatment. Albert Einstein's oft-quoted aphorism that "great spirits have always encountered violent opposition from mediocre minds" originated in his open letter, dated 19 March 1940, to Morris Raphael Cohen, a professor emeritus at CCNY, supporting Russell's appointment. Dewey and Horace M. Kallen edited a collection of articles on the CCNY affair in The Bertrand Russell Case. Russell soon joined the Barnes Foundation, lecturing to a varied audience on the history of philosophy; these lectures formed the basis of A History of Western Philosophy. His relationship with the eccentric Albert C. Barnes soon soured, and he returned to the UK in 1944 to rejoin the faculty of Trinity College. Russell participated in many broadcasts over the BBC, particularly The Brains Trust and the Third Programme, on various topical and philosophical subjects. By this time Russell was world-famous outside academic circles, frequently the subject or author of magazine and newspaper articles, and was called upon to offer opinions on a wide variety of subjects, even mundane ones. En route to one of his lectures in Trondheim, Russell was one of 24 survivors (among a total of 43 passengers) of an aeroplane crash in Hommelvik in October 1948. He said he owed his life to smoking since the people who drowned were in the non-smoking part of the plane. A History of Western Philosophy (1945) became a best-seller and provided Russell with a steady income for the remainder of his life. In 1942 Russell argued in favour of a moderate socialism, capable of overcoming its metaphysical principles, in an inquiry on dialectical materialism, launched by the Austrian artist and philosopher Wolfgang Paalen in his journal DYN, saying "I think the metaphysics of both Hegel and Marx plain nonsense – Marx's claim to be 'science' is no more justified than Mary Baker Eddy's. This does not mean that I am opposed to socialism." In 1943, Russell expressed support for Zionism: "I have come gradually to see that, in a dangerous and largely hostile world, it is essential to Jews to have some country which is theirs, some region where they are not suspected aliens, some state which embodies what is distinctive in their culture". 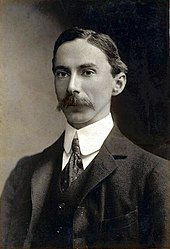 Bertrand Russell was opposed to war from early on, his opposition to World War I being used as grounds for his dismissal from Trinity College at Cambridge. This incident fused two of his most controversial causes, as he had failed to be granted Fellow status, which would have protected him from firing, because he was not willing to either pretend to be a devout Christian, or at least avoid admitting he was agnostic. Russell spent the 1950s and 1960s engaged in political causes primarily related to nuclear disarmament and opposing the Vietnam War. The 1955 Russell–Einstein Manifesto was a document calling for nuclear disarmament and was signed by eleven of the most prominent nuclear physicists and intellectuals of the time. In 1966–1967, Russell worked with Jean-Paul Sartre and many other intellectual figures to form the Russell Vietnam War Crimes Tribunal to investigate the conduct of the United States in Vietnam. He wrote a great many letters to world leaders during this period. In 1956, immediately before and during the Suez Crisis, Russell expressed his opposition to European imperialism in the Middle East. He viewed the crisis as another reminder of the pressing need for a more effective mechanism for international governance, and to restrict national sovereignty to places such as the Suez Canal area "where general interest is involved". At the same time the Suez Crisis was taking place, the world was also captivated by the Hungarian Revolution and the subsequent crushing of the revolt by intervening Soviet forces. Russell attracted criticism for speaking out fervently against the Suez war while ignoring Soviet repression in Hungary, to which he responded that he did not criticise the Soviets "because there was no need. Most of the so-called Western World was fulminating". Although he later feigned a lack of concern, at the time he was disgusted by the brutal Soviet response, and on 16 November 1956, he expressed approval for a declaration of support for Hungarian scholars which Michael Polanyi had cabled to the Soviet embassy in London twelve days previously, shortly after Soviet troops had already entered Budapest. In November 1957 Russell wrote an article addressing US President Dwight D. Eisenhower and Soviet Premier Nikita Khrushchev, urging a summit to consider "the conditions of co-existence". Khrushchev responded that peace could indeed be served by such a meeting. 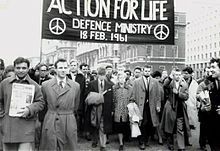 In January 1958 Russell elaborated his views in The Observer, proposing a cessation of all nuclear-weapons production, with the UK taking the first step by unilaterally suspending its own nuclear-weapons program if necessary, and with Germany "freed from all alien armed forces and pledged to neutrality in any conflict between East and West". US Secretary of State John Foster Dulles replied for Eisenhower. The exchange of letters was published as The Vital Letters of Russell, Khrushchev, and Dulles. Russell was asked by The New Republic, a liberal American magazine, to elaborate his views on world peace. He urged that all nuclear-weapons testing and constant flights by planes armed with nuclear weapons be halted immediately, and negotiations be opened for the destruction of all hydrogen bombs, with the number of conventional nuclear devices limited to ensure a balance of power. He proposed that Germany be reunified and accept the Oder-Neisse line as its border, and that a neutral zone be established in Central Europe, consisting at the minimum of Germany, Poland, Hungary, and Czechoslovakia, with each of these countries being free of foreign troops and influence, and prohibited from forming alliances with countries outside the zone. In the Middle East, Russell suggested that the West avoid opposing Arab nationalism, and proposed the creation of a United Nations peacekeeping force to guard Israel's frontiers to ensure that Israel was prevented from committing aggression and protected from it. He also suggested Western recognition of the People's Republic of China, and that it be admitted to the UN with a permanent seat on the UN Security Council. He was in contact with Lionel Rogosin while the latter was filming his anti-war film Good Times, Wonderful Times in the 1960s. He became a hero to many of the youthful members of the New Left. In early 1963, in particular, Russell became increasingly vocal in his disapproval of the Vietnam War, and felt that the US government's policies there were near-genocidal. In 1963 he became the inaugural recipient of the Jerusalem Prize, an award for writers concerned with the freedom of the individual in society. In 1964 he was one of eleven world figures who issued an appeal to Israel and the Arab countries to accept an arms embargo and international supervision of nuclear plants and rocket weaponry. In October 1965 he tore up his Labour Party card because he suspected Harold Wilson's Labour government was going to send troops to support the United States in Vietnam. 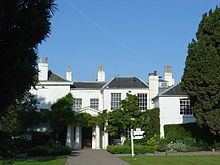 In June 1955 Russell had leased Plas Penrhyn in Penrhyndeudraeth, Merionethshire, Wales and on 5 July of the following year it became his and Edith's principal residence. Russell published his three-volume autobiography in 1967, 1968, and 1969. Russell made a cameo appearance playing himself in the anti-war Hindi film Aman, by Mohan Kumar, which was released in India in 1967. This was Russell's only appearance in a feature film. On 23 November 1969 he wrote to The Times newspaper saying that the preparation for show trials in Czechoslovakia was "highly alarming". The same month, he appealed to Secretary General U Thant of the United Nations to support an international war crimes commission to investigate alleged torture and genocide by the United States in South Vietnam during the Vietnam War. The following month, he protested to Alexei Kosygin over the expulsion of Aleksandr Solzhenitsyn from the Soviet Union of Writers. On 31 January 1970 Russell issued a statement condemning "Israel's aggression in the Middle East", and in particular, Israeli bombing raids being carried out deep in Egyptian territory as part of the War of Attrition. He called for an Israeli withdrawal to the pre-Six-Day War borders. This was Russell's final political statement or act. It was read out at the International Conference of Parliamentarians in Cairo on 3 February 1970, the day after his death. Russell died of influenza on 2 February 1970 at his home in Penrhyndeudraeth. His body was cremated in Colwyn Bay on 5 February 1970. In accordance with his will, there was no religious ceremony; his ashes were scattered over the Welsh mountains later that year. He left an estate valued at £69,423 (£1.09 million or US$1.4 million in 2018 money). In 1980 a memorial to Russell was commissioned by a committee including the philosopher A. J. Ayer. It consists of a bust of Russell in Red Lion Square in London sculpted by Marcelle Quinton. Lady Katharine Jane Tait, Russell's daughter, founded the Bertrand Russell Society in 1974 to preserve and understand his work. It publishes a newsletter, holds meetings and awards prizes for scholarship. She also authored several essays about her father; as well as a book, My Father, Bertrand Russell, which was published in 1975. Russell is generally credited with being one of the founders of analytic philosophy. He was deeply impressed by Gottfried Leibniz (1646–1716), and wrote on every major area of philosophy except aesthetics. He was particularly prolific in the field of metaphysics, logic and the philosophy of mathematics, the philosophy of language, ethics and epistemology. When Brand Blanshard asked Russell why he did not write on aesthetics, Russell replied that he did not know anything about it, though he hastened to add "but that is not a very good excuse, for my friends tell me it has not deterred me from writing on other subjects". On ethics, Russell considered himself a utilitarian. None of our beliefs are quite true; all have at least a penumbra of vagueness and error. The methods of increasing the degree of truth in our beliefs are well known; they consist in hearing all sides, trying to ascertain all the relevant facts, controlling our own bias by discussion with people who have the opposite bias, and cultivating a readiness to discard any hypothesis which has proved inadequate. These methods are practised in science, and have built up the body of scientific knowledge. Russell described himself in 1947 as an agnostic, saying: "Therefore, in regard to the Olympic gods, speaking to a purely philosophical audience, I would say that I am an Agnostic. But speaking popularly, I think that all of us would say in regard to those gods that we were Atheists. In regard to the Christian God, I should, I think, take exactly the same line." For most of his adult life, Russell maintained religion to be little more than superstition and, in spite of any positive effects, largely harmful to people. He believed that religion and the religious outlook serve to impede knowledge and foster fear and dependency, and to be responsible for much of our world's wars, oppression, and misery. He was a member of the Advisory Council of the British Humanist Association and President of Cardiff Humanists until his death. Political and social activism occupied much of Russell's time for most of his life. Russell remained politically active almost to the end of his life, writing to and exhorting world leaders and lending his name to various causes. Russell argued for a "scientific society", where war would be abolished, population growth would be limited, and prosperity would be shared. He suggested the establishment of a "single supreme world government" able to enforce peace, claiming that "the only thing that will redeem mankind is co-operation". Russell was an active supporter of the Homosexual Law Reform Society, being one of the signatories of A. E. Dyson's 1958 letter to The Times calling for a change in the law regarding male homosexual practices, which were partly legalised in 1967, when Russell was still alive. In "Reflections on My Eightieth Birthday" ("Postscript" in his Autobiography), Russell wrote: "I have lived in the pursuit of a vision, both personal and social. Personal: to care for what is noble, for what is beautiful, for what is gentle; to allow moments of insight to give wisdom at more mundane times. Social: to see in imagination the society that is to be created, where individuals grow freely, and where hate and greed and envy die because there is nothing to nourish them. These things I believe, and the world, for all its horrors, has left me unshaken". 1896. German Social Democracy. London: Longmans, Green. 1897. An Essay on the Foundations of Geometry. Cambridge: Cambridge University Press. 1900. A Critical Exposition of the Philosophy of Leibniz. Cambridge: Cambridge University Press. 1903. The Principles of Mathematics. Cambridge University Press. 1903. A Free man's worship, and other essays. 1905. "On Denoting", Mind, Vol. 14. ISSN 0026-4423. Basil Blackwell. 1910. Philosophical Essays. London: Longmans, Green. 1910–1913. Principia Mathematica (with Alfred North Whitehead). 3 vols. Cambridge: Cambridge University Press. 1912. The Problems of Philosophy. London: Williams and Norgate. 1914. Our Knowledge of the External World as a Field for Scientific Method in Philosophy. Chicago and London: Open Court Publishing. 1916. Principles of Social Reconstruction. London, George Allen and Unwin. 1916. Why Men Fight. New York: The Century Co.
1916. Justice in War-time. Chicago: Open Court. 1917. Political Ideals. New York: The Century Co.
1918. Mysticism and Logic and Other Essays. London: George Allen & Unwin. 1918. Proposed Roads to Freedom: Socialism, Anarchism, and Syndicalism. London: George Allen & Unwin. 1920. The Practice and Theory of Bolshevism. London: George Allen & Unwin. 1921. The Analysis of Mind. London: George Allen & Unwin. 1922. The Problem of China. London: George Allen & Unwin. 1923. The Prospects of Industrial Civilization, in collaboration with Dora Russell. London: George Allen & Unwin. 1923. The ABC of Atoms, London: Kegan Paul. Trench, Trubner. 1923. Human Knowledge: Its Scope and Limits. London: George Allen & Unwin. 1924. Icarus; or, The Future of Science. London: Kegan Paul, Trench, Trubner. 1925. The ABC of Relativity. London: Kegan Paul, Trench, Trubner. 1925. What I Believe. London: Kegan Paul, Trench, Trubner. 1926. On Education, Especially in Early Childhood. London: George Allen & Unwin. 1927. The Analysis of Matter. London: Kegan Paul, Trench, Trubner. 1927. An Outline of Philosophy. London: George Allen & Unwin. 1927. Why I Am Not a Christian. London: Watts. 1927. Selected Papers of Bertrand Russell. New York: Modern Library. 1928. Sceptical Essays. London: George Allen & Unwin. 1929. Marriage and Morals. London: George Allen & Unwin. 1930. The Conquest of Happiness. London: George Allen & Unwin. 1931. The Scientific Outlook, London: George Allen & Unwin. 1932. Education and the Social Order, London: George Allen & Unwin. 1934. Freedom and Organization, 1814–1914. London: George Allen & Unwin. 1935. In Praise of Idleness and Other Essays. London: George Allen & Unwin. 1935. Religion and Science. London: Thornton Butterworth. 1936. Which Way to Peace?. London: Jonathan Cape. 1937. The Amberley Papers: The Letters and Diaries of Lord and Lady Amberley, with Patricia Russell, 2 vols., London: Leonard & Virginia Woolf at the Hogarth Press. 1938. Power: A New Social Analysis. London: George Allen & Unwin. 1940. An Inquiry into Meaning and Truth. New York: W. W. Norton & Company. 1945. The Bomb and Civilisation. Published in the Glasgow Forward on August 18, 1945. 1945. A History of Western Philosophy and Its Connection with Political and Social Circumstances from the Earliest Times to the Present Day New York: Simon and Schuster. 1949. Authority and the Individual. London: George Allen & Unwin. 1950. Unpopular Essays. London: George Allen & Unwin. 1951. New Hopes for a Changing World. London: George Allen & Unwin. 1952. The Impact of Science on Society. London: George Allen & Unwin. 1953. Satan in the Suburbs and Other Stories. London: George Allen & Unwin. 1954. Human Society in Ethics and Politics. London: George Allen & Unwin. 1954. Nightmares of Eminent Persons and Other Stories. London: George Allen & Unwin. 1956. Portraits from Memory and Other Essays. London: George Allen & Unwin. 1956. Logic and Knowledge: Essays 1901–1950, edited by Robert C. Marsh. London: George Allen & Unwin. 1957. Why I Am Not A Christian and Other Essays on Religion and Related Subjects, edited by Paul Edwards. London: George Allen & Unwin. 1958. Understanding History and Other Essays. New York: Philosophical Library. 1959. Common Sense and Nuclear Warfare. London: George Allen & Unwin. 1959. My Philosophical Development. London: George Allen & Unwin. 1959. Wisdom of the West, edited by Paul Foulkes. London: Macdonald. 1960. Bertrand Russell Speaks His Mind, Cleveland and New York: World Publishing Company. 1961. The Basic Writings of Bertrand Russell, edited by R. E. Egner and L. E. Denonn. London: George Allen & Unwin. 1961. Fact and Fiction. London: George Allen & Unwin. 1961. Has Man a Future? London: George Allen & Unwin. 1963. Essays in Skepticism. New York: Philosophical Library. 1963. Unarmed Victory. London: George Allen & Unwin. 1965. Legitimacy Versus Industrialism, 1814–1848. London: George Allen & Unwin (first published as Parts I and II of Freedom and Organization, 1814–1914, 1934). 1965. On the Philosophy of Science, edited by Charles A. Fritz, Jr. Indianapolis: The Bobbs–Merrill Company. 1966. The ABC of Relativity. London: George Allen & Unwin. 1967. Russell's Peace Appeals, edited by Tsutomu Makino and Kazuteru Hitaka. Japan: Eichosha's New Current Books. 1967. War Crimes in Vietnam. London: George Allen & Unwin. 1969. Dear Bertrand Russell... A Selection of his Correspondence with the General Public 1950–1968, edited by Barry Feinberg and Ronald Kasrils. London: George Allen and Unwin. Russell was the author of more than sixty books and over two thousand articles. Additionally, he wrote many pamphlets, introductions, and letters to the editor. One pamphlet titled, 'I Appeal unto Caesar': The Case of the Conscientious Objectors, ghostwritten for Margaret Hobhouse, the mother of imprisoned peace activist Stephen Hobhouse, allegedly helped secure the release from prison of hundreds of conscientious objectors. His works can be found in anthologies and collections, including The Collected Papers of Bertrand Russell, which McMaster University began publishing in 1983. By March 2017 this collection of his shorter and previously unpublished works included 18 volumes, and several more are in progress. A bibliography in three additional volumes catalogues his publications. The Russell Archives held by McMaster's William Ready Division of Archives and Research Collections possess over 40,000 of his letters. ^ Monmouthshire's Welsh status was ambiguous at this time, and was considered by some to be part of England. See Monmouthshire (historic)#Ambiguity over status. ^ Irvine, Andrew David (1 January 2015). Zalta, Edward N. (ed.). Bertrand Russell – The Stanford Encyclopedia of Philosophy. Metaphysics Research Lab, Stanford University – via Stanford Encyclopedia of Philosophy. ^ Carlo Cellucci, Rethinking Knowledge: The Heuristic View, Springer, 2017, p. 32. ^ The Problem of Perception (Stanford Encyclopedia of Philosophy): "Paraphrasing David Hume (1739...; see also Locke 1690, Berkeley 1710, Russell 1912): nothing is ever directly present to the mind in perception except perceptual appearances." ^ Howard Wettstein, "Frege-Russell Semantics? ", Dialectica 44(1–2), 1990, pp. 113–135, esp. 115: "Russell maintains that when one is acquainted with something, say, a present sense datum or oneself, one can refer to it without the mediation of anything like a Fregean sense. One can refer to it, as we might say, directly." ^ Dowe, Phil (10 September 2007). Zalta, Edward N. (ed.). Causal Processes – The Stanford Encyclopedia of Philosophy. Metaphysics Research Lab, Stanford University – via Stanford Encyclopedia of Philosophy. ^ Ronald Jager (2002). The Development of Bertrand Russell's Philosophy, Volume 11. Psychology Press. pp. 113–114. ISBN 978-0-415-29545-1. ^ Nicholas Griffin, ed. (2003). The Cambridge Companion to Bertrand Russell. Cambridge University Press. p. 85. ISBN 978-0-521-63634-6. ^ Roberts, George W. (2013). Bertrand Russell Memorial Volume. Routledge. p. 311. ISBN 978-1-317-83302-4. ^ Rosalind Carey; John Ongley (2009). Historical Dictionary of Bertrand Russell's Philosophy. Scarecrow Press. p. 94. ISBN 978-0-8108-6292-0. ^ Schultz, Bart. "Henry Sidgwick". Stanford Encyclopedia of Philosophy. 2015. ^ Ilkka Niiniluoto (2003). Thomas Bonk (ed.). Language, Truth and Knowledge: Contributions to the Philosophy of Rudolf Carnap. Springer. p. 2. ISBN 978-1-4020-1206-8. ^ Wolfgang Händler; Dieter Haupt; Rolf Jelitsch; Wilfried Juling; Otto Lange (1986). CONPAR 1986. Springer. p. 15. ISBN 978-3-540-16811-9. ^ Hao Wang (1990). Reflections on Kurt Gödel. MIT Press. p. 305. ISBN 9780262730877. ^ Phil Parvin (2013). Karl Popper. C. Black. ISBN 978-1-62356-733-0. ^ Roger F. Gibson, ed. (2004). The Cambridge Companion to Quine. Cambridge University Press. p. 2. ISBN 9780521639491. ^ Robert F. Barsky (1998). Noam Chomsky: A Life of Dissent. MIT Press. p. 32. ISBN 978-0-262-52255-7. ^ François Cusset (2008). French Theory: How Foucault, Derrida, Deleuze, & Co. Transformed the Intellectual Life of the United States. University of Minnesota Press. p. 97. ISBN 978-0-8166-4732-3. ^ Alan Berger, ed. (2011). Saul Kripke. Cambridge University Press. ISBN 978-1-139-50066-1. ^ Dov M. Gabbay; Paul Thagard; John Woods; Theo A. F. Kuipers (2007). "The Logical Approach of the Vienna Circle and their Followers from the 1920s to the 1950s". General Philosophy of Science: Focal Issues: Focal Issues. Elsevier. p. 432. ISBN 978-0-08-054854-8. ^ Dermot Moran (2012). Husserl's Crisis of the European Sciences and Transcendental Phenomenology: An Introduction. Cambridge University Press. p. 204. ISBN 9780521895361. ^ Grattan-Guinness. "Russell and G.H. Hardy: A study of their Relationship". McMaster University Library Press. Retrieved 3 January 2014. ^ Douglas Patterson (2012). Alfred Tarski: Philosophy of Language and Logic. Palgrave Macmillan. ISBN 978-0-230-36722-7. ^ Rosalind Carey; John Ongley (2009). Historical Dictionary of Bertrand Russell's Philosophy. Scarecrow Press. pp. 15–16. ISBN 978-0-8108-6292-0. ^ Ray Monk (2013). Robert Oppenheimer: A Life Inside the Center. Random House. ISBN 978-0-385-50413-3. ^ Anita Burdman Feferman; Solomon Feferman (2004). Alfred Tarski: Life and Logic. Cambridge University Press. p. 67. ISBN 978-0-521-80240-6. ^ Andrew Hodges (2012). Alan Turing: The Enigma. Princeton University Press. p. 81. ISBN 978-0-691-15564-7. ^ Jacob Bronowski (2008). The Origins of Knowledge and Imagination. Yale University Press. ISBN 978-0-300-15718-5. ^ Nicholas Griffin; Dale Jacquette, eds. (2008). Russell vs. Meinong: The Legacy of "On Denoting". Taylor & Francis. p. 4. ISBN 978-0-203-88802-5. ^ Sankar Ghose (1993). "V: Europe Revisited". Jawaharlal Nehru, a Biography. Allied Publishers. p. 46. ISBN 978-81-7023-369-5. ^ "Street-Fighting Years: An Autobiography of the Sixties". Verso. p. 2005. ^ Michael Albert (2011). Remembering Tomorrow: From SDS to Life After Capitalism: A Memoir. Seven Stories Press. ISBN 978-1-60980-001-7. ^ Jon Lee Anderson (1997). Che Guevara: A Revolutionary Life. Grove Press. p. 38. ISBN 978-0-8021-9725-2. ^ Marc Joseph (2004). "1: Introduction: Davidson's Philosophical Project". Donald Davidson. McGill-Queen's Press – MQUP. p. 1. ISBN 978-0-7735-2781-2. ^ James A. Marcum (2005). "1: Who is Thomas Kuhn?". Thomas Kuhn's Revolution: An Historical Philosophy of Science. Continuum. p. 5. ISBN 978-1-84714-194-1. ^ Nathan Salmon (2007). "Introduction to Volume II". Content, Cognition, and Communication : Philosophical Papers II: Philosophical Papers II. Oxford University Press. p. xi. ISBN 978-0-19-153610-6. ^ Christopher Hitchens, ed. (2007). The Portable Atheist: Essential Readings for the Nonbeliever. Da Capo Press. ISBN 978-0-306-81608-6. ^ Gregory Landini (2010). Russell. Routledge. p. 444. ISBN 978-0-203-84649-0. ^ Carl Sagan (2006). Ann Druyan (ed.). The Varieties of Scientific Experience: A Personal View of the Search for God. Penguin. ISBN 978-1-59420-107-3. ^ George Crowder (2004). Isaiah Berlin: Liberty, Pluralism and Liberalism. Polity. p. 15. ISBN 978-0-7456-2477-8. ^ Elsie Jones-Smith (2011). Theories of Counseling and Psychotherapy: An Integrative Approach: An Integrative Approach. SAGE. p. 142. ISBN 978-1-4129-1004-0. ^ "Interview with Martin Gardner" (PDF). American Mathematical Society. June – July 2005. p. 603. Retrieved 5 January 2014. ^ Peter S. Williams (2013). C S Lewis Vs The New Atheists. Authentic Media. ISBN 978-1-78078-093-1. ^ Loretta Lorance; Richard Buckminster Fuller (2009). Becoming Bucky Fuller. MIT Press. p. 72. ISBN 978-0-262-12302-0. ^ K. Sohail (February 2000). "How Difficult it is to Help People Change their Thinking – Interview with Dr. Pervez Hoodbhoy". Archived from the original on 16 July 2012. Retrieved 31 December 2013. ^ Bradley W. Bateman; Toshiaki Hirai; Maria Cristina Marcuzzo, eds. (2010). The Return to Keynes. Harvard University Press. p. 146. ISBN 978-0-674-05354-0. ^ Isaac Asimov (2009). I. Asimov: A Memoir. Random House. ISBN 978-0-307-57353-7. ^ Paul Kurtz (1994). Vern L. Bullough; Tim Madigan (eds.). Toward a New Enlightenment: The Philosophy of Paul Kurtz. Transaction Publishers. p. 233. ISBN 978-1-4128-4017-0. ^ John P. Anderson (2000). Finding Joy in Joyce: A Readers Guide to Ulysses. Universal-Publishers. p. 580. ISBN 978-1-58112-762-1. ^ Paul Lee Thomas (2006). Reading, Learning, Teaching Kurt Vonnegut. Peter Lang. p. 46. ISBN 978-0-8204-6337-7. ^ Gregory L. Ulmer (2005). Electronic Monuments. U of Minnesota Press. p. 180. ISBN 978-0-8166-4583-1. ^ Paul J. Nahin (2011). "9". Number-Crunching: Taming Unruly Computational Problems from Mathematical Physics to Science Fiction. Princeton University Press. p. 332. ISBN 978-1-4008-3958-2. ^ Mie Augier; Herbert Alex; er Simon; James G. March, eds. (2004). Models of a Man: Essays in Memory of Herbert A. Simon. MIT Press. p. 21. ISBN 978-0-262-01208-9. ^ William O'Donohue; Kyle E. Ferguson (2001). The Psychology of B F Skinner. SAGE. p. 19. ISBN 978-0-7619-1759-5. ^ Gustavo Faigenbaum (2001). Conversations with John Searle. LibrosEnRed.com. p. 28. ISBN 978-987-1022-11-3. ^ William M. Brinton; Alan Rinzler, eds. (1990). Without Force Or Lies: Voices from the Revolution of Central Europe in 1989–90. Mercury House. p. 37. ISBN 978-0-916515-92-8. ^ David Wilkinson (2001). God, Time and Stephen Hawking. Kregel Publications. p. 18. ISBN 978-0-8254-6029-6. ^ Reiner Braun; Robert Hinde; David Krieger; Harold Kroto; Sally Milne, eds. (2007). Joseph Rotblat: Visionary for Peace. John Wiley & Sons. ISBN 978-3-527-61127-0. ^ Ned Curthoys; Debjani Ganguly, eds. (2007). Edward Said: The Legacy of a Public Intellectual. Academic Monographs. p. 27. ISBN 978-0-522-85357-5. ^ "Frank Wilczek - Biographical". Nobel Media AB 2017. Another thing that shaped my thinking was religious training. I was brought up as a Roman Catholic. I loved the idea that there was a great drama and a grand plan behind existence. Later, under the influence of Bertrand Russell's writings and my increasing awareness of scientific knowledge, I lost faith in conventional religion. ^ a b Kreisel, G. (1973). 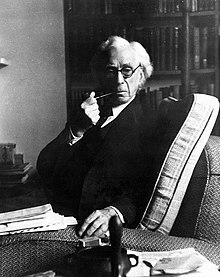 "Bertrand Arthur William Russell, Earl Russell. 1872–1970". Biographical Memoirs of Fellows of the Royal Society. 19: 583–620. doi:10.1098/rsbm.1973.0021. JSTOR 769574. 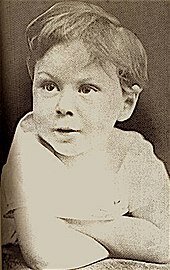 ^ The Life of Bertrand Russell. Knopf. 1976. p. 119. ISBN 9780394490595. He became a relentless political activist during World War I, and throughout his life was an ardent advocate of parliamentary democracy through his support first of the Liberal Party and then of Labour. ^ Bertrand Russell. Autobiography. p. 260. ISBN 9780415189859. I have imagined myself in turn a Liberal, a Socialist, or a Pacifist, but I have never been any of these things, in any profound sense. ^ Hestler, Anna (2001). Wales. Marshall Cavendish. p. 53. ISBN 978-0-7614-1195-6. ^ Russell and G. E. Moore broke themselves free from British Idealism which, for nearly 90 years, had dominated British philosophy. Russell would later recall in "My Mental Development" that "with a sense of escaping from prison, we allowed ourselves to think that grass is green, that the sun and stars would exist if no one was aware of them ..."—Russell B, (1944) "My Mental Development", in Schilpp, Paul Arthur: The Philosophy of Bertrand Russell, New York: Tudor, 1951, pp. 3–20. ^ Ludlow, Peter. "Descriptions, The Stanford Encyclopedia of Philosophy (Fall 2008 Edition), Edward N. Zalta (ed.)". ^ a b c d e f g "The Bertrand Russell oGallery". Russell.mcmaster.ca. 6 June 2011. Archived from the original on 28 September 2011. Retrieved 1 October 2011. ^ a b Paul, Ashley. "Bertrand Russell: The Man and His Ideas". Archived from the original on 1 May 2006. Retrieved 28 October 2007. ^ Russell, Bertrand and Perkins, Ray (ed.) Yours faithfully, Bertrand Russell. Open Court Publishing, 2001, p. 4. ^ a b Bloy, Marjie, PhD. "Lord John Russell (1792–1878)". Retrieved 28 October 2007. ^ Cokayne, G. E.; Vicary Gibbs, H. A. Doubleday, Geoffrey H. White, Duncan Warrand and Lord Howard de Walden, eds. The Complete Peerage of England, Scotland, Ireland, Great Britain and the United Kingdom, Extant, Extinct or Dormant, new ed. 13 volumes in 14. 1910–1959. Reprint in 6 volumes, Gloucester, UK: Alan Sutton Publishing, 2000. ^ Bertrand Russell (1998). Autobiography. Psychology Press. p. 38. ISBN 9780415189859. ^ a b c d The Nobel Foundation (1950). Bertrand Russell: The Nobel Prize in Literature 1950. Retrieved 11 June 2007. ^ Russell, Bertrand (1967). The Autobiography of Bertrand Russell: 1872–1914 (2000 ed.). New York: Routledge. p. 30. ^ Paul, Ashley. "Bertrand Russell: The Man and His Ideas - Chapter 2". Archived from the original on 1 January 2009. Retrieved 6 December 2018. ^ Bertrand Russell (1998). Autobiography. Psychology Press. p. 35. ISBN 9780415189859. ^ "1959 Bertrand Russell CBC interview". 1959. ^ Bertrand Russell (1998). "2: Adolescence". Autobiography. Psychology Press. ISBN 9780415189859. ^ "Bertrand Russell on God". Canadian Broadcasting Corporation. 1959. Archived from the original on 26 January 2010. Retrieved 8 March 2010. ^ Russell, Bertrand (1967). The Autobiography of Bertrand Russell: 1872–1914 (2000 ed.). New York: Routledge. p. 39. ^ "Russell, the Hon. Bertrand Arthur William (RSL890BA)". A Cambridge Alumni Database. University of Cambridge. ^ O'Connor, J. J.; Robertson, E. F. (October 2003). "Alfred North Whitehead". School of Mathematics and Statistics, University of St Andrews, Scotland. Retrieved 8 November 2007. ^ Griffin, Nicholas; Lewis, Albert C. "Russell's Mathematical Education". Notes and Records of the Royal Society of London. 44 (1): 51–71. doi:10.1098/rsnr.1990.0004. JSTOR 531585. ^ Russell, Bertrand (1967). The Autobiography of Bertrand Russell: 1872–1914 (2000 ed.). New York: Routledge. p. 72. ^ Monk, Ray (1996). Bertrand Russell: The Spirit of Solitude, 1872–1921. Simon and Schuster. p. 37. ISBN 978-0-684-82802-2. ^ Moran, Margaret (1991). "Bertrand Russell Meets His Muse: The Impact of Lady Ottoline Morrell (1911–12)". McMaster University Library Press. Retrieved 1 March 2012. ^ Russell, Bertrand (2002). Griffin, Nicholas (ed.). The Selected Letters of Bertrand Russell: The Public Years, 1914-1970. Psychology Press. p. 230. ISBN 978-0-415-26012-1. ^ Kimball, Roger (September 1992). "Love, logic & unbearable pity: The private Bertrand Russell". The New Criterion. Archived from the original on 5 December 2006. Retrieved 15 November 2007. ^ a b "London School of Economics". Lse.ac.uk. 26 August 2015. ^ Russell, Bertrand (2001). Ray Perkins (ed.). Yours Faithfully, Bertrand Russell: Letters to the Editor 1904–1969. Chicago: Open Court Publishing. p. 16. ISBN 0-8126-9449-X. Retrieved 16 November 2007. ^ "Bertrand Russell, biography". Nobelprize.org. Retrieved 23 June 2010. ^ Bertrand Russell (1998). "6: Principia Mathematica". Autobiography. Psychology Press. ISBN 9780415189859. ^ "Russell on Wittgenstein". Rbjones.com. Retrieved 1 October 2011. ^ Hochschild, Adam (2011). "I Tried to Stop the Bloody Thing". The American Scholar. Retrieved 10 May 2011. ^ Scharfenburger, Paul (17 October 2012). "1917". MusicandHistory.com. Archived from the original on 17 January 2012. Retrieved 7 January 2014. ^ Russell, Bertrand (1995). "A Summer of Hope". Pacifism and Revolution. Routledge. p. xxxiv. ^ "British Socialists – Peace Terms Discussed". The Sydney Morning Herald. 5 June 1917. Retrieved 7 January 2014. ^ Vellacott, Jo (1980). Bertrand Russell and the Pacifists in the First World War. Brighton: Harvester Press. ISBN 0-85527-454-9. ^ Bertrand Russell (1998). "8: The First War". Autobiography. Psychology Press. ISBN 9780415189859. ^ "Trinity in Literature". Trinity College. Retrieved 3 August 2017. ^ "M. P.'s Who Have Been in Jail To Hold Banquet". The Reading Eagle. 8 January 1924. Retrieved 18 May 2014. ^ G. H. Hardy (1970). Bertrand Russell and Trinity. pp. 57–8. ^ "Bertrand Russell (1872–1970)". Farlex, Inc. Retrieved 11 December 2007. ^ Russell, Bertrand (31 July 1920). "Soviet Russia—1920". The Nation. pp. 121–125. Retrieved 20 August 2016. ^ Russell, Bertrand (20 February 2008) [First published 1920]. "Lenin, Trotzky and Gorky". The Nation. Retrieved 20 August 2016. ^ Russell, Bertrand (1972). The Problem of China. London: George Allen & Unwin Ltd. p. 252. ^ a b "Bertrand Russell Reported Dead" (PDF). The New York Times. 21 April 1921. Retrieved 11 December 2007. ^ Russell, Bertrand (2000). Richard A. Rempel (ed.). Uncertain Paths to Freedom: Russia and China, 1919–22. The Collected Papers of Bertrand Russell. 15. Routledge. lxviii. ISBN 0-415-09411-9. ^ Bertrand Russell (1998). Autobiography. Psychology Press. p. 386. ISBN 9780415189859. ^ a b "Dora Russell". 12 May 2007. Archived from the original on 19 January 2008. Retrieved 17 February 2008. ^ Kranz, D. (2011): Barry Stevens: Leben Gestalten. In: Gestaltkritik, 2/2011, p. 4-11. ^ Stevens, B. (1970): Don't Push the River. Lafayette, Cal. (Real People Press), p. 26. ^ Gorham, D. (2005): Dora and Bertrand Russell and Beacon Hill School, in: Russell: the Journal of Bertrand Russell Studies, n.s. 25, (summer 2005), p. 39 – 76, p. 57. ^ Spadoni, C. (1981): Recent Acquisitions: Correspondence, in: Russell: the Journal of Bertrand Russell Studies, Vol 1, Iss. 1, Article 6, 43 – 67. ^ "Museum Of Tolerance Acquires Bertrand Russell's Nazi Appeasement Letter". Losangeles.cbslocal.com. 19 February 2014. Retrieved 29 March 2017. ^ McCarthy, Joseph M. (May 1993). The Russell Case: Academic Freedom vs. Public Hysteria (PDF). Educational Resources Information Center. p. 9. ^ Leberstein, Stephen (November – December 2001). "Appointment Denied: The Inquisition of Bertrand Russell". Academe. Archived from the original on 23 January 2015. Retrieved 17 February 2008. ^ Einstein quotations and sources.. Retrieved 9 July 2009. ^ "Bertrand Russell". 2006. Archived from the original on 12 February 2008. Retrieved 17 February 2008. ^ Bertrand Russell (1998). Autobiography. Psychology Press. p. 512. ISBN 9780415189859. ^ "Bertrand Russell and Preventive War" (PDF). Plymouth.edu. Archived from the original (PDF) on 5 March 2017. Retrieved 29 March 2017. ^ "A philosopher's letters – Love, Bertie". The Economist. 21 July 2001. ^ He wrote: "There is reason to think Stalin will insist on a new orthodoxy in atomic physics, since there is much in quantum theory that runs contrary to Communist dogma. An atomic bomb' made on Marxist principles would probably not explode because, after all, Marxist science was that of a hundred years ago. For those who fear the military power of Russia there is, therefore, some reason to rejoice in the muzzling of Russian science." Russell, Bertrand "Stalin Declares War on Science" Review of Langdon-Davies, Russia Puts Back the Clock, Evening Standard (London), 7 September 1949, p. 9. ^ "The life of Bertrand Russell: Ronald William Clark: 9780394490595: Amazon.com: Books". Amazon.com. ^ –06:04. "Radio 4 Programmes – The Reith Lectures". BBC. Retrieved 1 October 2011. ^ –06:04. "Radio 4 Programmes – The Reith Lectures: Bertrand Russell: Authority and the Individual: 1948". BBC. Retrieved 1 October 2011. ^ T. P. Uschanov, The Strange Death of Ordinary Language Philosophy. The controversy has been described by the writer Ved Mehta in Fly and the Fly Bottle (1963). ^ "No. 38628". The London Gazette (Supplement). 3 June 1949. p. 2796. ^ Frances Stonor Saunders, "The Cultural Cold War: The CIA and the World of Arts and Letters." New York Press, 1999. Print. ^ Frances Stonor Saunder, ""The Cultural Cold War: The CIA And the World of Arts and Letters." New York Press, 1999. Print. ^ Russell, Bertrand (1967). The Autobiography of Bertrand Russell, Vol. 3. Little, Brown. p. 157. ^ Sanderson Beck (2003–2005). "Pacifism of Bertrand Russell and A. J. Muste". World Peace Efforts Since Gandhi. Sanderson Beck. Retrieved 24 June 2012. ^ John H. Davis. The Kennedys: Dynasty and Disaster. S. P. Books. p. 437. ^ Peter Knight, The Kennedy Assassination, Edinburgh University Press Ltd., 2007, p. 77. ^ Russell, Bertrand; Albert Einstein (9 July 1955). "Russell Einstein Manifesto". Retrieved 17 February 2008. ^ "Jerusalem International Book Fair". Jerusalembookfair.com. Retrieved 1 October 2011. ^ "Bertrand Russell Appeals to Arabs and Israel on Rocket Weapons". Jewish Telegraphic Agency. ^ Russell, Bertrand. Andrew G. Bone (ed.). The Collected Papers of Bertrand Russell Volume 29: Détente Or Destruction, 1955–57. Abingdon: Routledge. p. iii. ISBN 978-0415-3583-78. ^ "Aman (1967)". Internet Movie Database. ^ "Bertrand Russell's Last Message". Connexions.org. 31 January 1970. Retrieved 29 March 2017. 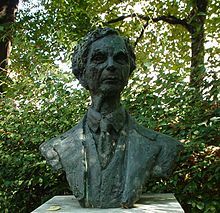 ^ "Bertrand Russell Memorial". Mind. 353: 320. 1980. 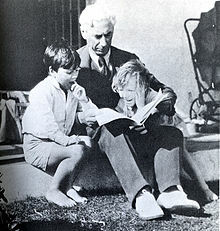 ^ "My Father, Bertrand Russell". National Library of Australia. Retrieved 28 May 2010. ^ Blanshard, in Paul Arthur Schilpp, ed., The Philosophy of Brand Blanshard, Open Court, 1980, p. 88, quoting a private letter from Russell. ^ The Autobiography of Bertrand Russell, London: Routledge, 2000 [London: Allen and Unwin, 1969, Vol. 1], p. 39 ("It appeared to me obvious that the happiness of mankind should be the aim of all action, and I discovered to my surprise that there were those who thought otherwise. Belief in happiness, I found, was called Utilitarianism, and was merely one among a number of ethical theories. I adhered to it after this discovery."). ^ Russell, Bertrand (1947). "Am I An Atheist or an Agnostic?". Encyclopedia of Things. Archived from the original on 22 June 2005. Retrieved 6 July 2005. : "I never know whether I should say "Agnostic" or whether I should say "Atheist"... As a philosopher, if I were speaking to a purely philosophic audience I should say that I ought to describe myself as an Agnostic, because I do not think that there is a conclusive argument by which one prove (sic) that there is not a God. On the other hand, if I am to convey the right impression to the ordinary man in the street I think I ought to say that I am an Atheist..."
^ Russell, Bertrand (1952). "Conclusions". The Impact of Science on Society. ^ Russell, Bertrand (1936). Which Way to Peace? (Part 12). M. Joseph Ltd. p. 173. ^ Russell, Bertrand (1954). Human Society in Ethics and Politics. London: G. Allen & Unwin. p. 212. ^ Gay and Lesbian Humanist Association (2 November 1997). "Lesbian and Gay Rights: The Humanist and Religious Stances". Retrieved 17 February 2008. ^ Russell, Bertrand (1968). The Autobiography of Bertrand Russell: 1944–1969. Little, Brown. p. 330. Published separately as 'Reflections on My Eightieth Birthday' in Portraits from Memory. ^ "An essay on the foundations of geometry". Internet Archive. ^ "The Principles of Mathematics". fair-use.org. ^ "Principia mathematica, by Alfred North Whitehead ... and Bertrand Russell". umich.edu. ^ "The Problems of Philosophy". ditext.com. ^ "OUR KNOWLEDGE OF THE EXTERNAL WORLD". Internet Archive. ^ "Principles of social reconstruction". Internet Archive. ^ "Political Ideals". Project Gutenberg. ^ "Proposed Roads to Freedom". Project Gutenberg. ^ Kevin C. Klement. "Russell's Introduction to Mathematical Philosophy". umass.edu. ^ Pfeiffer, G. A. (1920). "Review: Introduction to Mathematical Philosophy by Bertrand Russell" (PDF). Bull. Amer. Math. Soc. 27 (2): 81–90. doi:10.1090/s0002-9904-1920-03365-3. ^ "Introduction to mathematical philosophy". Internet Archive. ^ "The Practice and Theory of Bolshevism". Project Gutenberg. ^ "The Analysis of Mind". Project Gutenberg. ^ "The Problem of China". Project Gutenberg. ^ "Why I Am Not A Christian". positiveatheism.org. Archived from the original on 19 November 2006. ^ "The Scientific Outlook". Internet Archive. ^ "Education and the Social Order". Internet Archive. ^ "In Praise of Idleness By Bertrand Russell". zpub.com. ^ "Western Philosophy". Internet Archive. ^ "Authority and the individual". Internet Archive. ^ "Unpopular Essays". Internet Archive. ^ "Nightmares of Eminent Persons And Other Stories". Internet Archive. ^ "Portraits From Memory And Other Essays". Internet Archive. ^ "Common Sense And Nuclear Warfare". Internet Archive. ^ "MY PHILOSOPHICAL DEVELOPMENT". Internet Archive. ^ a b "The Autobiography of Bertrand Russell 1872 1914". Internet Archive. ^ Hochschild, Adam (2011). To end all wars: a story of loyalty and rebellion, 1914–1918. Boston: Houghton Mifflin Harcourt. pp. 270–272. ISBN 0-618-75828-3. ^ "McMaster University: The Bertrand Russell Research Centre". Russell.mcmaster.ca. 6 March 2017. Retrieved 29 March 2017. ^ "Bertrand Russell Archives Catalogue Entry and Research System". McMaster University Library. The William Ready Division of Archives and Research Collections. Retrieved 5 February 2016. 1900, Sur la logique des relations avec des applications à la théorie des séries, Rivista di matematica 7: 115–148. 1901, On the Notion of Order, Mind (n.s.) 10: 35–51. 1902, (with Alfred North Whitehead), On Cardinal Numbers, American Journal of Mathematics 24: 367–384. 1948, BBC Reith Lectures: Authority and the Individual A series of six radio lectures broadcast on the BBC Home Service in December 1948. John Newsome Crossley. A Note on Cantor's Theorem and Russell's Paradox, Australian Journal of Philosophy 51, 1973, 70–71. Ivor Grattan-Guinness. The Search for Mathematical Roots 1870–1940. Princeton: Princeton University Press, 2000. Alan Ryan. Bertrand Russell: A Political Life, New York: Oxford University Press, 1981. Alfred Julius Ayer. Russell, London: Fontana, 1972. ISBN 0-00-632965-9. A lucid summary exposition of Russell's thought. Celia Green. The Lost Cause: Causation and the Mind-Body Problem, Oxford: Oxford Forum, 2003. ISBN 0-9536772-1-4 Contains a sympathetic analysis of Russell's views on causality. A. C. Grayling. Russell: A Very Short Introduction, Oxford University Press, 2002. Nicholas Griffin. Russell's Idealist Apprenticeship, Oxford: Oxford University Press, 1991. A. D. Irvine (ed.). Bertrand Russell: Critical Assessments, 4 volumes, London: Routledge, 1999. Consists of essays on Russell's work by many distinguished philosophers. Michael K. Potter. Bertrand Russell's Ethics, Bristol: Thoemmes Continuum, 2006. A clear and accessible explanation of Russell's moral philosophy. Elizabeth Ramsden Eames. Bertrand Russell's Theory of Knowledge, London: George Allen and Unwin, 1969. A clear description of Russell's philosophical development. P. A. Schilpp (ed.). The Philosophy of Bertrand Russell, Evanston and Chicago: Northwestern University, 1944. John Slater. Bertrand Russell, Bristol: Thoemmes Press, 1994. Alan Wood. Bertrand Russell The Passionate Sceptic London: George Allen & Unwin, 1957. Peter Stone et al. Bertrand Russell´s Life and Legacy. Wilmington: Vernon Press, 2017. "Bertrand Russell's Ethics". Internet Encyclopedia of Philosophy. "Bertrand Russell's Logic". Internet Encyclopedia of Philosophy. "Bertrand Russell's Metaphysics". Internet Encyclopedia of Philosophy. O'Connor, John J.; Robertson, Edmund F., "Bertrand Russell", MacTutor History of Mathematics archive, University of St Andrews .